I’ll cut to the chase straight away today and say that the wind and rain today were vying with each other as to which one could be the most obnoxious. Yes, this is getting personal now. I understand that Wimbledon is due to start tomorrow but really! I have a master plan to cross the Loire by ferry tomorrow which meant that today was a short ride from Blain to St. Etienne de Montluc which was just as well given the foul conditions. Since there is no convenient campsite on the south bank I decided to lay up and pitch on to the ferry first thing tomorrow and then make some headway south. I’m feeling rather guilty about not making much progress in the last couple of days, but the guilt has been balanced by some good meals, a rest, and not getting soaked for hours. The wind didth blow again today and as (bad) luck would have it today’s campsite is high on a hill (yodellayee, yodellayee, yodelay hee hoo) so the westerly hurricane that has blown all day is now whistling straight up my teepee. I must confess that I’m getting bored doing a daily weather report, but it’s been so grim that it keeps demanding attention. However, to balance things up a bit, I’ve now had a week to get used to my kit, so here’s a quick report on the good, the bad and the indifferent. I think after this week’s trials, best in class has to go to my tent, lent to me by a wizened old bike traveller friend of mine. As he foretold, it’s kept me dry and warm, is easily put up and take downable even by a rank amateur and has been a minor revelation. Runner up has been my Jetboil, which for those not in the know, is a super efficient stove for boiling water. It really does do what it says on the neoprene covered tin and now I’m used to it, I can knock up a coffee in a couple of minutes. Very impressed. My bike has been solid and reliable and despite being loaded to the gunnels has been a pleasure to ride. I’ve had sore legs most days but the Brooks saddle has been great, so I’ve not been saddle sore at all. The Rohloff gears have been fantastic for changing when standing still and the quiet belt drive is a joy. My only regret is that I didn’t get some guttering fitted. At this stage, the only bit of kit that has yet to come up to the mark is my solar panel. In fairness, a more perceptive choice of battery charger would have been a windmill, given the weather, but hopefully, nature’s lighting system will be switched on soon. Woke up to a blue sky and the wind had dropped to a Force 10. The campsite at St. Etienne is truly bizarre; first, there is very little grass as they cater for a lot of camper vans, the result being that it’s more of an elaborate car park than campsite. And second, the communal loos and showers are fantastic, with designer basins and spotlessly clean. So far, the standard of cleanliness of the facilities has been first class. Amazingly, I was on the road by half eight, and found both a baker for my morning croissant and my route out of town. Said route was the through the flood plain of the Loire to catch the ferry to Le Pellerin. Beautiful country lanes, quiet countryside, sun and even a couple of storks flew overhead (white, long necks but not swans. Could have been crows). The ferry was free and uneventful, and the road to my destination of Machecoul was flattish, pretty and only slightly hilly. This is more like it. I met a Polish man touring on a mountain bike with very little kit and no map and he was riding like a man possessed to get to the Atlantic by the end of the day. The speed he was going, there was going to be quite a splash when he got there. I’ve now reached the Vendée and the sun has been shining and tonight’s campsite had a holiday feel to it with lots of nice people that I’ve nattered to, and even le weefee which has allowed me to upload my first blog. I had a long chat with my French neighbours about everything and nothing, had a play with their two rescue dogs, Alice and O’Mally and just to top the evening off while I was having my dinner under my own personal weeping willow by a stream, a duck came to check me out with her four ducklings. I didn’t give her any food so she waddled off with the kids in tow. What a great day, today turned out to be. My neighbours in the campsite at Machecoul could not have been nicer and even made me coffee to start my day off. Spent half an hour and rode 4 kms just trying to get out of town as there was not a meaningful signpost in sight but once I was on my way I had the nicest ride of the trip so far. Still hilly but a much more enjoyable ride in the sunshine. Having bought some bread, ham and cheese for lunch, I played an absolute blinder and found a beautiful, quiet little corner of France for a picnic lunch. Alarm bells were ringing earlier as I am getting closer to the tourist areas which means that cheap municipal campsites with basic amenities are thin on the ground, to be replaced with private sites with swimming pools, playgrounds and all kinds of other stuff that I don’t want and don’t want to pay for. So far, I’ve been paying around €5 a night, but I’m told that the private ones can be €18 and upwards. 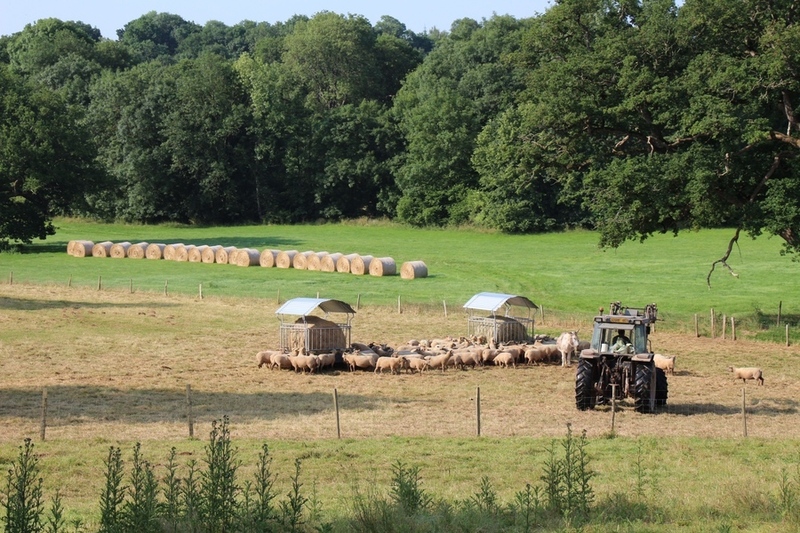 So the campsite gods were smiling on me when I found a sheep farm that not only has camping facilities (shower block etc. ), but had very few people there and all of whom were really nice. I got invited by two 18 year old lads to join them and another French girl for aperitif and dinner. Apart from feeling particularly old, it was a lovely sociable evening, not least because it was so unexpected. I had the longest cycle of my trip today at 70km so I’m a bit bushed to say the least. Started the day off today in sunshine, listening to sheep bleating, and another nice neighbour in my farm campsite getting me a croissant for brekkie. I could get used to this. I found today a really hard ride, not least because I covered a lot of distance yesterday, but also, ironically after last week’s weather, I think the sun has got to me a bit. I’ve got dainty little sunburnt arrows on my lily white feet through the holes of my sandals. 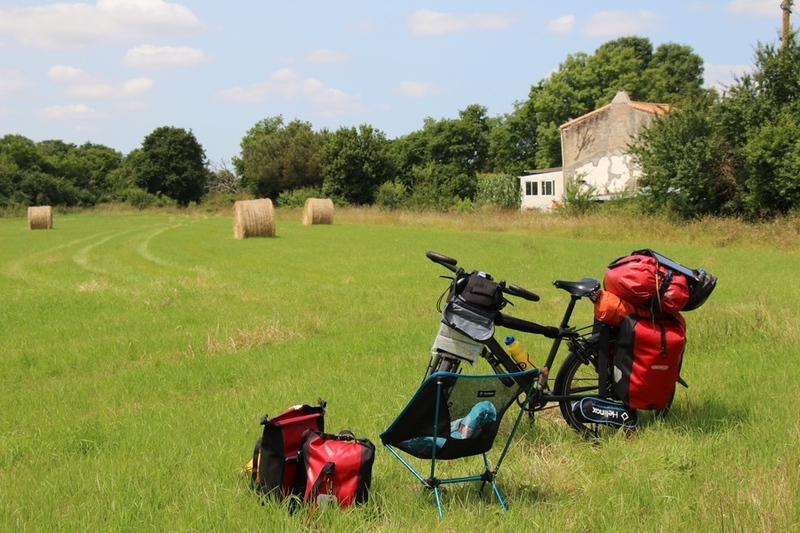 I started off tired but as the day wore on I found myself crossing the marshland of the Vendée with mile after mile of straight flat roads with a crosswind blowing on an irritable cyclist. By the time I stopped at around 3.30 I was beyond the pail. Luckily, I’m staying with a friend tonight in a house with a proper bed, so it’s going to be early to the land of nod for me (8.30 as it turned out) but this has been a slightly alarming day. With the sun and humidity, it’s dawned on me how big France is and how tiring it is to cycle even modest distances. We went for a short walk by the seaside after dinner at La Tranche sur mer, as I’ve never seen the Atlantic ocean before. Well I’ve seen it now and the thought of following the coast for mile after mile with sand and and a sea breeze, beautiful though it is, does not appeal. I have serious doubts whether I’d be able to complete the tour in two months so tomorrow I’ll have a look at my map and take an executive decision. Rest day at Chez Dédé. I only managed to sleep for 12 hours last night so I didn’t want to over stretch my self today. We spent the morning discussing the world at large, doing some long overdue washing and looking at maps, planning the next portion of my tour. I’ve decided to head slightly inland and then south for a couple of reasons. First and foremost, the coast route will add zillions (beaucoup) of miles to my trip, and although the seaside has its own beauty I’m more drawn to the countryside. Also, the holiday season is just about to kick off and the campsites by the coast, with swimming pools, playgrounds and bouncy châteaux are not my thing du tout. Inland we go! Steak and chips washed down with a light rosé in a seaside restaurant with a friend was a joy. I managed to leave my bag in the restaurant when we left so at least I haven’t forgotten how to be an amnesiac. It was safe and sound and I recovered it before they carried out an explosion contrôlé. This afternoon was a very sedate affair with me doing very little, while Dédé, 20 odd years my senior, worked like a Trojan in the afternoon sun, cutting the lawn. My comeuppance will come up tomorrow when I resume le tour. I left Dédé’s this morning at around 9.30 feeling slightly flat as the size of this challenge has begun to dawn on me. Dédé was the perfect host and spoilt me rotten so it has been quite sobering to get back on the bike and must confess to feeling slightly lonely. The first part of the ride was across the marshlands (le marais) and unlike the other day, the weather was mild with an overcast sky. The key word here is ‘mild’. After feeling drained by the sun and humidity a couple of days ago, I’ve realised that I’m going to have to start riding earlier in the day because once the heat kicks in, lugging the bike up hills is hard work. I can’t say the marshlands really did it for me – relatively treeless with kilometre after kilometre of flat fields. Part of me regrets having to say goodbye to the coastline but a decision had to be made and I’m sure I made the right one for me. Perhaps. I made really good time to a town called Marans for lunch and then made even better time leaving it. Not the nicest place I’ve ever been to. However, not long after, I found myself going up a slight hill which meant the end of the marshes, and then in the middle of the countryside with miles of wheat fields with poppies growing in them. Lovely campsite tonight in a tiny town called Benon. Just me and a Dutch couple with warm sunshine filtering through the trees and a gourmet supper of 6 chipolatas. As I write this journal at the end of the day, it would be nice to say what a lovely birthday I had cycling through the French countryside in the sunshine, unfortunately it didn’t quite live up to expectations. The countryside was indeed lovely and I went through several lovely little villages with castles, beautiful old houses, streams and all. But the weather, by way of a change, was a pain in the bum. It’s been dull and overcast all day long with spells of misty rain that eventually wore me down. The countryside today was miles and miles of wheat and maize fields. I’m not sure that it’s really wheat, but it looks like the picture a Kellogs packet and I saw a sign that said the maize is grown to make grocery bags(?). But with nature’s lighting system needing a new bulb, it all looked flat. Fact: France is a big country. When you’re cycling in a straight line on a road that sometimes goes up a bit and then goes down a bit and either side is wheat or plastic bag fields, you realise how big France is. 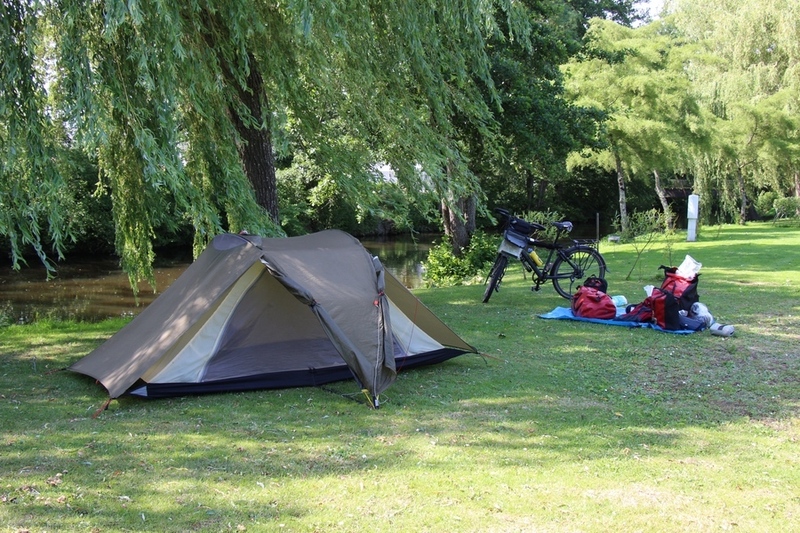 My usual method of finding a municipal campsite via a tourist office went completely pear-shaped today as tourism doesn’t happen at the weekends, which is why the tourist offices close at lunchtime. I ended up in a pretty little privately owned site in Le Gicq, but it was touch and go at one point as to whether today would be my first go at wild camping. I covered about 70km today which I’m pleased with but it’s not been one of the best birthdays I’ve ever had. After all the moaning of last week’s trials, I’ve fallen on my feet in spades today. I met a lovely couple, brother and sister, Guillaume and Caroline, who invited me to their house for lunch in the most amazing country setting. I’m uploading this post tout de suite at their house but will write more details for next weeks edition. Sorry for not catching up with you yesterday on your birthday Richard. Glad to see you are keeping sane and enjoying French hospitality! I see it wasnt one of your best but enjoy the peace and tranquility as i am sure it is a world away from the streets of britain. I will keep looking for your blogs, keep safe and have some vin pain and bousain en route.